SharePoint was first launched as an intranet for content and document management. Today Microsoft has added a lot of other possibilities to SharePoint, and the platform has become the most important for corporate collaboration. The kalmstrom.com team makes intense use of SharePoint, so it is logical that we also increase the development of new solutions that make SharePoint do more. The SharePoint version of Calendar Browser builds on the same idea as the Outlook version: each resource has its own calendar, and users book a resource by making an appointment/creating an event in its calendar. Most people already know how to manage a calendar, so Calendar Browser is very easy to learn. The Calendar Browser features Search and Resource Decriptions, make the booking even easier, as they help users to quickly understand what resources are free at any given time and which of them will be most suitable for each occasion. The main advantage of the Calendar Browser SharePoint version compared to the Outlook version, is that you can reach it via the internet. This is becoming increasingly important. More and more people work in the cloud, and Microsoft is favoring their cloud platforms strongly – just like kalmstrom.com does! Where ever you are, when you need to book one of your organization's resources – a room, a car, a lecturer or anything else you can think of – just log into your team site, go to the Calendar Browser page and make your booking. We still have to wait a couple of months left before the new solution can be released, but we already have a web page with a presentation of the new kalmstrom.com resource booking solution for SharePoint. This page will be continuously updated as the development proceeds, and new pages will be added. Therefore, please visit it often if you are interested in Calendar Browser for SharePoint. 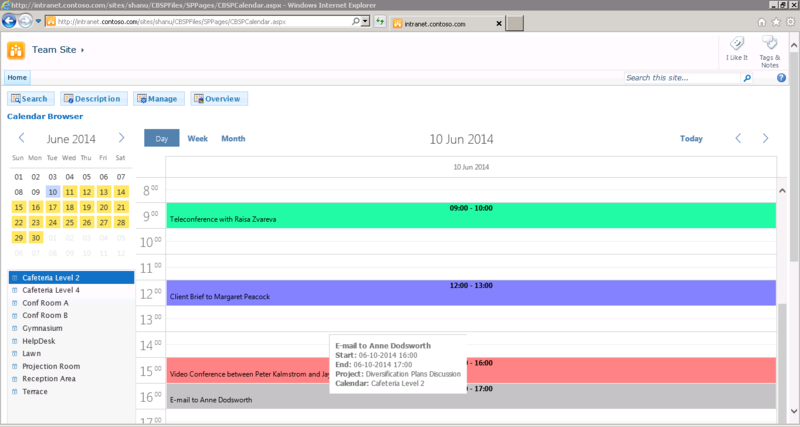 My task to lead the development of Calendar Browser for SharePoint is very interesting, but it is not a simple one. Innovative development is never easy and always full of challenges, and that is just how I want my work to be. There are many problems to solve and new methods to figure out, and I often have stimulating discussions with my colleagues. Their input is invaluable to me, and together we will create a great SharePoint solution!